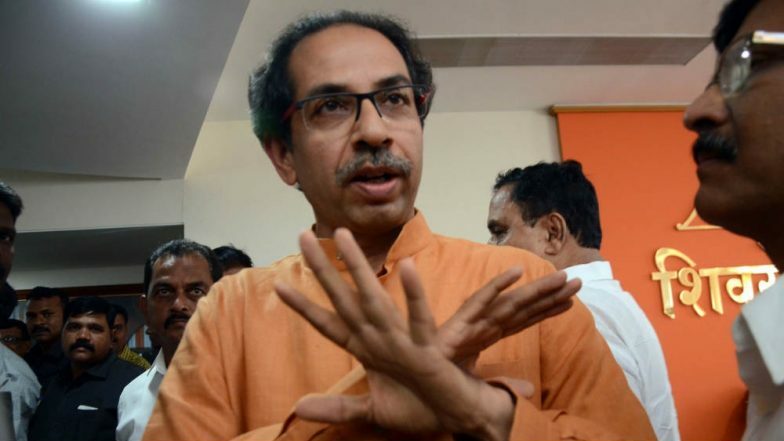 Mumbai, April 12: The Shiv Sena Friday advised its ally BJP to "speak less" on the Rafale deal, in which the Congress has alleged corruption, cautioning that unwanted statements may increase troubles for the national party. The Sena also said the ban on NaMo TV could have been avoided had the BJP been satisfied with the coverage being given to Prime Minister Narendra Modi's campaign rallies on electronic channels. The Uddhav Thackeray-led party sought to corner its senior ally over the recent clash between BJP workers in the presence of Maharashtra minister Girish Mahajan at a public rally in Jalgaon, where the party has changed its Lok Sabha candidate. "The shocking video (of the clash) was seen across the country. The BJP inducted goons in the party and turned them into 'Valmikis'. However here, the experienced Valmikis turned into goons and indulged in violence." Narendra Modi Government Compromised on National Security: Left Parties on Rafale Deal Verdict. "This is not only a blot on the campaigning of `mahayuti' (the BJP-Sena alliance), but the time has come for the BJP to clarify its stand," the Sena said in an editorial in party mouthpiece 'Saamana'. The Sena said the BJP, which calls itself a party with a difference, cannot justify this violence and dismiss the incident as one reflecting diverse opinions. "At least on the Rafale issue, one needs to shed arrogance and talk with patience. Right from the defence minister to other leaders, people (in the BJP) are speaking whatever they like. "This may increase troubles for the party and therefore we advise that the lesser spoken the better," the Sena said. The Marathi daily noted the Supreme Court Wednesday rejected the government's contention that sensitive documents accessed by the media on the Rafale deal can't be treated as evidence and said it will examine the papers while reviewing its December 14 order giving a clean chit to the contract. The Congress has alleged a massive corruption in the Rs 58,000-crore Rafale deal and its president Rahul Gandhi has repeatedly targeted the prime minister over the issue. The Sena said along with the ban on release of a biopic on Modi, the Election Commission has also disallowed airing of political content on NaMo TV. It is the BJP's internal matter if it needs a separate television for the prime minister's publicity, it said. "Except one or two channels, every channel has become 'NaMo TV'. Modi's speeches are being given prominence and the ban on NaMo TV could have been avoided. "The BJP has influence over electronic channels and the party is reaping its benefits,," the Sena said. Citing the its own example, the editorial said the biopic on late Sena patriarch Bal Thackeray was released in January because the party did not want the EC to conclude that the film was made keeping elections in mind.